The summery temperatures of the past days made for a canopy almost completely full of leaves. It is only on some more open spaces that the sun can still reach the flowers. The bluebells are withering and are forming fruit. The white flowers of Ramsons (Bear’s Garlic) are forming beautiful white carpets. Salomon’s seal with its white hanging fowers is blooming, gracefully bending over. Wood-sorrel keeps blooming in the shadow of the conifers, and Herb-Paris is blooming. Along the edges of the wood, Wood spurge and the bushy Bird cherry is blooming. It is getting more difficult for the sun to reach the flowers as the canopy of leaves gets denser. Even then, it is worthwhile to visit the wood. The bluebells that bloomed first are withering, and the flower carpet is fading. In the valleys where blooming started later, bluebells still have their purple blue colour. Meanwhile, Greater Stitchwort, Yellow Archangel and the beautiful Herb Paris are blooming. 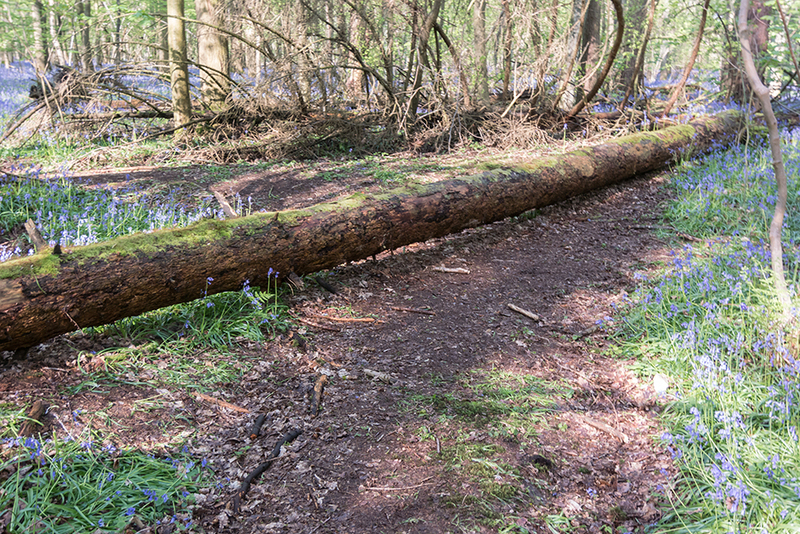 When visiting the wood, please observe the main accessibility rule: always stay on the official paths so as not to make worse the damage that has been done to the very fragile vegetation. Also when making pictures: stay on the official paths. Continue for a while along the path and you will come to beautiful places. On many places the bluebells are just along the paths. It is only when trampling on them that they retreat. You are in a fragile and protected nature reserve. Respect it, and do not destroy it. If you come to enjoy the wood the following days, please stay on the official paths. If what seems a path, is not on the hiking map, it is not a path at all. It is one of the many ‘self-made’ paths made by careless visitors over the last 4 weeks. On many places where there were bluebells a month ago, there is only a bare patch now. Such a pity! The magnificent natural phenomenon of spring wildflowers forming a flower carpet in the Hallerbos is fragile and protected vegetation. It is strictly forbidden to go off the official paths, it is an offence. 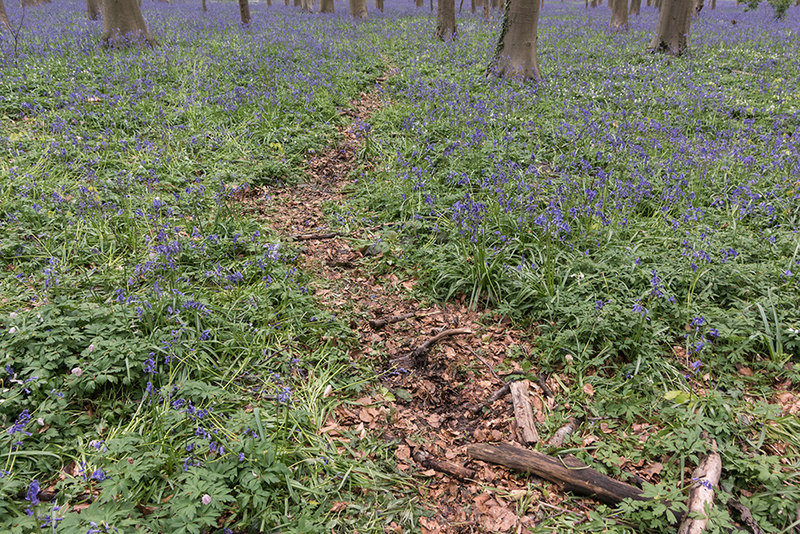 Anything between the flowers towards a tree stump or a fallen tree is NOT an official path. Bluebells do not tolerate trampling. If people step on a place in the wood, the earth gets dense and hard and no bluebells can grow there anymore. Right now, their leaves are forming a new flower bulb for next year. By trampling them, this tiny flower bulb is destroyed and there will not be a flower, only a bare patch next year. The same goes when stepping on dry beech or oak leaves between the flowers. The small root that comes from the hyacinth’s seed will not be able to penetrate the soil there, and there will be no new flower there in the future. This is how the bare patches along the paths get bigger every year and some consider them paths (but they are not official paths at all). Do you want to enjoy this beautiful forest and protect it? 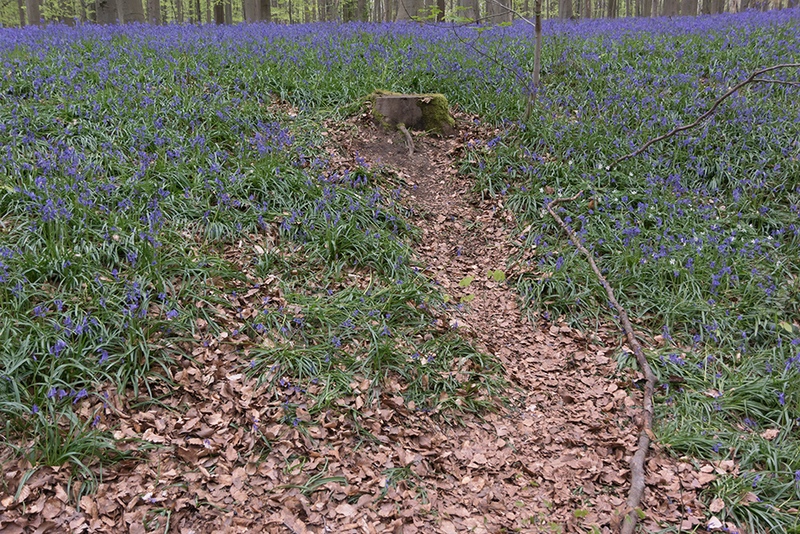 Then always stay on the official paths and never step on places where there are dry tree leaves, do not trample on the bluebells and their leaves. Thank you! The bloom of the bluebells has passed its peak. In the valleys where they started blooming about 10 days later, they are still beautiful and still have their deep purple blue colour. When the sun gets the chance to pierce through the clouds, she can still reach the bluebells through the beech leaves and illuminate the purple blue flower carpet. If you want to come and enjoy the fairy-like spring, you must come the following sunny days. The weather forecast promises sun tomorrow and on Sunday. If you come by bus during the week: from Monday 2 May, bus TEC 114 isn’t going in the direction in the wood anymore, probably until the end of the road works on the Nijvelsesteenweg. A day full of April showers. The last stage of the beautiful period has started a week ago with the high trees getting into leaves. This means that the canopy above the bluebells will be full of leaves in a few days and this makes it harder and harder for the sun to reach the bluebells. Meanwhile, a lot of other spring bloomers have started blooming: Ramsons, Garlic Mustard, Cuckoo-flower, Pendulous sedge, Early dog-violet, Lords-and-ladies and Wood-sorrel. A wonderful day in the forest thanks to the sun and the clouds. 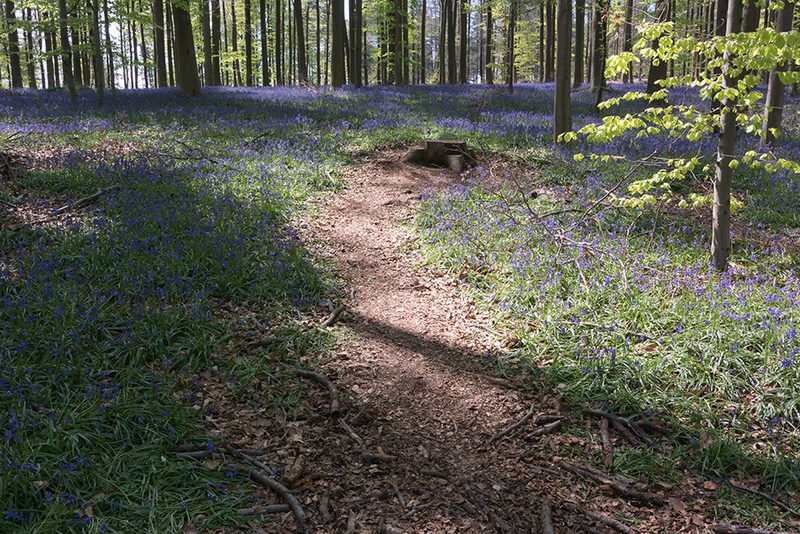 The sun can still reach the bluebells through the canopy and offers an enchanting sight of different shades of purple. The slopes and the valleys as well, are beautifully in bloom now. The canopy gets denser by the day, as there are more and more leaves. The forecasted cold temperatures for the coming days may slow down the further coming into leaves of the trees. That leaves some more days to enjoy the fairylike spring. An unexpectedly sunny, brilliant day. The numerous bluebells now form a deep purple blue flower carpet. The sun, the passing clouds and the shadow of the young beech leaves constantly bring changes in the colour of the flowers. The translucent green leaves start forming a canopy above the bluebells, but still a few days remain to enjoy this wonderful spring event. Regrettably, some careless visitors keep going off the paths, and go between the flowers and sneak in the wood to take pictures. This is extremely harmful, the wood suffers irreversible damage. The flowers are lost forever on those places. A message to the photographer that left his black camera bag with materials, and a tripod: they were brought in by an honest finder. Also in the subdued light from a clouded sun, the wood is mesmerising. The high trees get more and more leaves every day. It stays worthwhile to plan a visit to the wood. Unfortunately, the weather forecast is not rosy for the coming days. The slopes are turning purple blue as well. Tomorrow afternoon there is the yearly ‘bluebell jogging’. The start and finish are outside the forest. The second day of pure enjoyment of the beautiful spring colours from sunrise to sunset. The sunlight filters through the fragile young beech leaves and illuminates them. When the sunlight hits the bluebells directly, they seem light purple; in the shadow of a tree that has some leaves or when a cloud passes before the sun, they are deep purple blue. The bluebells enthral the walkers with their wonderful scent. The wood is at its most beautiful and excites all senses, it is hard to describe, better to come and experience this live. Due to today’s warmth, the trees will have a lot of new leaves tomorrow. Unfortunately the weather forecast is quite grim just when the wood is so magnificent.